American history has been a rich breeding ground for heroes of all descriptions. 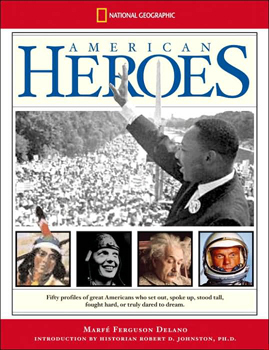 In American Heroes, you’ll find a collection of some of the most inspiring, most exciting, and most touching stories from great achievers of the past 400 years. This group of lively profiles includes unsung heroes such as Queen Liluokalani, the last Hawaiian monarch, as well as more famous ones, such as Benjamin Franklin and Eleanor Roosevelt. Time lines and historic photo essays put the heroes in context and help chart how our perception of heroism has changed over time. Fact boxes provide easy reference. And more than 300 photographs and illustrations…make this volume as visually stunning to browse as it is gripping to read.